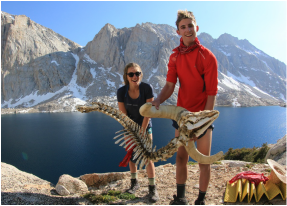 Muir Wise is a summer wilderness education program designed to promote self-knowledge and personal growth through an exciting three-week backcountry adventure. Our goal is to help our students develop valuable leadership qualities while honing their outdoor skills, and to create an intimate connection to the natural world, thereby fostering a sense of environmental stewardship. Unique to the program is its focus on creating an intellectual as well as an intuitive connection to the natural world through its commitment to a slow daily pace. In promoting an experiential-- rather than destination-oriented-- mindset, we provide ample time for reading, writing, drawing, and nature observation as we travel through some of California's most breathtaking wilderness. Muir Wise begins with five days of skills training at Golden Trout Wilderness School. 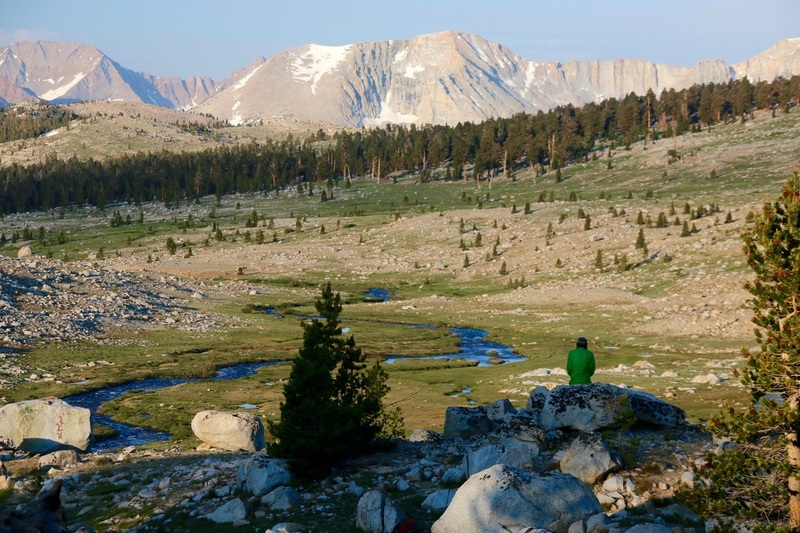 The first two days are spent at and around the school's facility and are designed to help acclimate students to both the elevation at which the program will be operating- GTWS sits at 10,200 feet and much of the backcountry portion takes place in the highest Sierra- and to the ethos of the program. This entails learning how to slow down and see, hear, smell, and deeply observe the wild world all around us. Students are also grounded at this time in fundamental wilderness skills to help them navigate the weeks ahead. The latter half of this first week is dedicated to attaining a certification in wilderness first aid through a 20 hour course at the school's campus. Throughout this week, the students are treated to wonderful nutritious meals served up from the camp kitchen, and their evenings are spent around the campfire and under a canopy of brilliant stars. On the sixth day, students depart from Golden Trout and head into the backcountry for their first week of the Wilderness Immersion section. This portion of the program focuses on delving into a wide array of nature-centered learning. With students adopting various roles, each acts at once as student and as expert and teacher to their peers in their particular discipline. With mindfulness and curiosity as our central tenets, short hiking days are interspersed with time for students to study, learn from others, observe the natural world, draw, and teach. This week is guided by the experienced hands of the program's instructors, wilderness experts steeped in local knowledge and with their own diversity of talents. Students will also benefit from meeting and spending time with the local rangers who offer their own unique perspective as seasonal denizens of the wilderness. Each role is supported by dozens of texts (each student is assigned a Kindle with a role-specific selection of books) and by the instruction of their two expert teacher-guides. The Muir Wise mobile library contains more than 70 texts on an amazing variety of subjects! After a week of walking and learning, the students arrive at the solo location where the group meets their resupply. Following a celebratory meal, students are set out at solo sites where they spend the next 48 hours on a monitored solo. These two full days alone mark a distinct transition in the Muir Wise Program after which the students become the authors and leaders of their wilderness experience. Post-solo, the students hit the trail once again, this time in control of their own week-long backpacking trip from the solo location back to Golden Trout. The adult instructors recede into supporting roles, and the group uses all they have learned to author their own unique experience as they return home. During this week roles are exchanged, cooperation and leadership are tested, and students are forever transformed. The first was probably the second or third day of Muir Wise, we were all playing camouflage (we had just eaten a magnificent Marcus-made lunch). I realized that I was having more fun then, just playing with them, than I had had in awhile, because I seriously hadn't just played in awhile. Sure teenagers goof off all the time, which of course is fun, but we also get caught up in this seriousness, and the need to feel mature and adult-like. I hadn't realized how much we needed to just play again, and we were playing outside. Quite literally just running around in the woods, without any distractions from electronics and without needing to feel like we had to fit in someplace. The second memory was on the last day of Muir Wise, when we were back at camp. I was sitting by the stream, looking out at the meadow. The birds were singing, the grass was dancing, the wild flowers smelled sweet, the trees were standing happy and strong, and the mountains were looking as magnificent as ever. I suddenly had a strong urge just to be more a part of it, so I quietly crept across the brook and sat under a willow, distancing myself from the people. It was then that I saw a doe, and her two tiny fawns. They couldn't see me, but I just sat there and watched in awe. Please get in touch with your questions and comments!